Santa Express was a boost for MCRY all around! Not only did we have better ridership than last year but Santa loaned us a few elves for a week!! 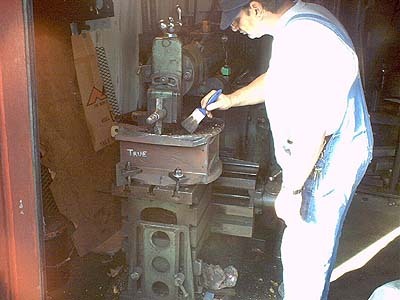 The work started off Nov. 26th with Head Elf Bob Ristow beginning the transformation of a pile of parts into a smokebox for the WC&C #1. Also up to help was Bob Jackson, Kelly Bauman, Ed Ripp, Jim Baker, Jim Busse and later on to include Doug Crary & Al Joyce. One step was to lay out the spacing for the door ring studs on 2 half-circles of steel and then drill the holes. 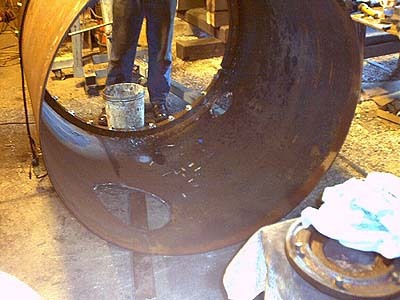 The holes will later be threaded and have studs inserted to hold the ring that then holds the smokebox door and engine number plate. Another step accomplished was to lay out the location for and cut the hole for the smokestack in a cylinder of steel that had been rolled and then tacked together. 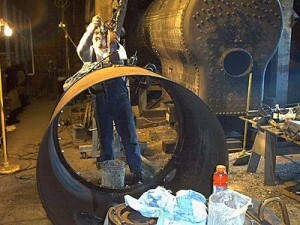 This cylinder forms the body of the smokebox. 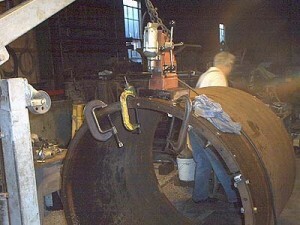 There also was a hole laid out and cut for the inspection/cleanout hole on the fireman’s side. 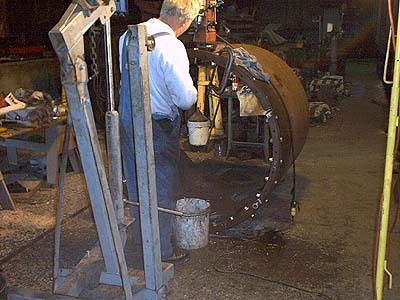 As the week progressed and with the aid of a tool loaned by Skip Lichter the two half-circles of steel for the door ring support were fitted to the inside edge of the front of the smokebox and then drilled for the rivets that will hold them in place. 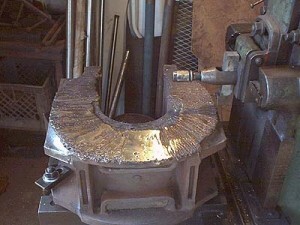 Two reinforcing plates or welts for the seam of the smokebox were fitted and then drilled for the rivets that will hold them in place and the smokebox in a circle. The photos show the semi-finished product. On the 4th we had additional help from Elf Eric. Sorry but I didn’t get a last name but would be glad to include it later. He helped Al Joyce with the continuing stud program and from Al’s words he’s welcome back any time. Doug Crary ran a welded driving box from the frame through the shaper. 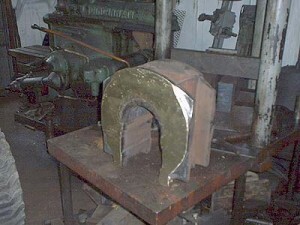 This is to give a smooth surface to the repaired face as well as cut the box to the proper dimension. 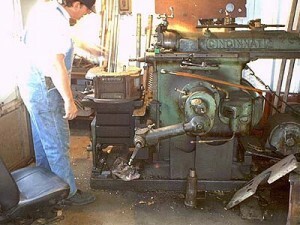 In the photos you can see Doug attending to the machine and then the box at the end of the day. Some work needs yet to be done. The Christmas present of Bob Ristow all week long, Jim Baker for five days, and the others each weekend has been a huge boost on the project.